Jada and her Uncle George from "In My Family," a story that teaches children how to cope with having a parent in prison. 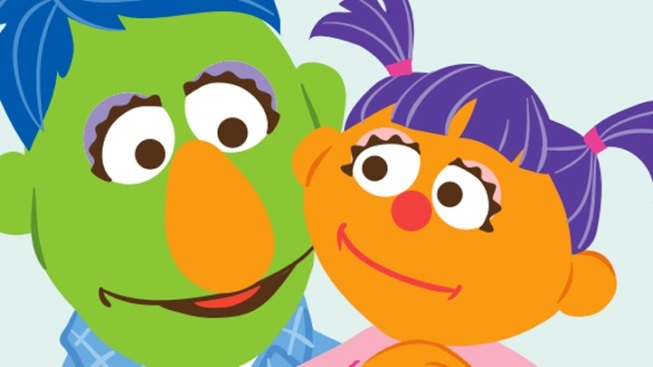 The producers of “Sesame Street” have come up with new tools on their website to help children and caregivers cope when parents land in prison. The program “Little Children, Big Challenges: Incarceration” includes a toolkit complete with printable guidebooks, storybooks, activity books, videos and tips for caregivers to help children manage their anxiety while their parent is in prison. There is even an iPhone and Android app. It's a topic that caregivers have trouble addressing, but Justice Department data shows that more than 2.7 million children in the U.S. have a parent behind bars, according to psychologist Julie Poehlmann. More than 1.2 million of the 2.3 million people behind bars in the U.S. are parents to children under the age of 18, according to a 2010 study by the Pew Charitable Trust. Research shows that kids with parents who are serving time tend to fare poorly in school. Twenty three percent of children with a father who has served time have been expelled or suspended, compared with only four percent of children whose fathers have not been in jail, the Pew report says. To help children maintain stability, the website dispenses tips for adults like "Build Security: In the morning, let your child know some of the things that will happen throughout the day. For example, 'Grandma will pick you up from school. Then you'll go to the park, and later we'll all have dinner together.'" One of the activity books prompt children to draw pictures that reflect how they’re feeling -- angry, upset or sad. The reading material includes a book that tells the story of Jada, who finds herself feeling sad when her school’s Family Fun Night reminds her that her father is unable to join because he is in prison. Jada's story concludes with her uncle reminding her that in her father's absense, he will love and care for her. “We need to help kids realize it’s not their fault,” Poehlmann says.